WSDOT currently uses the Superpave (Gyratory) mix design method, but historically it used the Hveem method. Like the Marshall and Superpave methods, the Hveem method has been proven to produce quality HMA from which long-lasting pavements can be constructed. 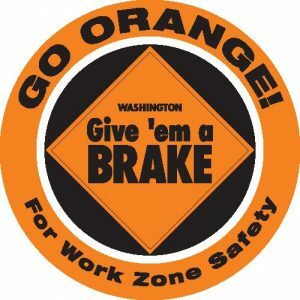 This section briefly discusses the Hveem mix design method, but this design method has largely been displaced by the Superpave (Gyratory) mix design method and has no current application in Washington State or elsewhere in the USA. 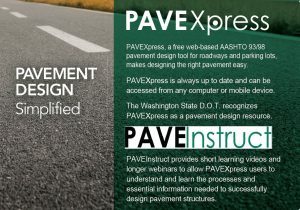 WSDOT uses the Superpave mix design method. Some agencies and private laboratories use the Marshall method. Each method has been proven to produce quality HMA from which long-lasting pavements can be constructed. The basic concepts of the Hveem mix design method were originally developed by Francis Hveem when he was a Resident Engineer for the California Division of Highways in the late 1920s and 1930s. Aggregate selection. Different agencies/owners specify different methods of aggregate acceptance. Typically, a battery of aggregate physical tests is run periodically on each particular aggregate source. Then, for each mix design, gradation and size requirements are checked. Normally, aggregate from more than one source is required to meet gradation requirements. Asphalt binder selection. An asphalt binder is selected. Most agencies use the Superpave PG system for asphalt binder specification. In the past, under the older aged residue (AR) system commonly used grades in Washington were AR-4000W and AR-2000W. Prepare 6 initial samples, each at a different asphalt binder content. For instance, one sample each might be made at 4.5, 5.0, 5.5, 6.0, 6.5 and 7 percent asphalt by dry weight for a total of six samples. Compact these trial mixes in the California Kneading Compactor (see Figure 1). This compactor is specific to the Hveem mix design method. Test the samples for stability and cohesion using the Hveem stabilometer (see Figures 2 and 3) and cohesiometer. These tests are specific to the Hveem mix design method. Passing values of stability and cohesion depend upon the mix class being evaluated. 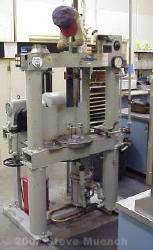 Typically, all samples pass the cohesion test and three or four pass the stability test. Determine the density and other volumetric properties of the samples. Select the optimum asphalt binder content. The asphalt binder content corresponding to 4 percent air voids is selected as long as this binder content passes stability and cohesion requirements. Typical Hveem mix design specifications from an older 2002 version of the WSDOT Standard Specifications for Road, Bridge and Municipal Construction are reproduced in Table 1. This table does not list all specifications.